Maytag<sup></sup> appliances are built tough for the most intimidating jobs, and this large capacity dryer is no exception to the rule. With the PowerDry cycle and an impressive 7.0 cu. ft. capacity, it'll get your largest loads dried every time. And because waiting for the dryer is no fun, Maytag added features like the Rapid Dry cycle to get your small loads ready in no time. With features like an extra interior fin to cut down on balling, tumbling, and tangling and an enhanced steam cycle, this high capacity dryer doesn't take shortcuts when it comes to emptying your hamper. Plus, it's designed, engineered and assembled in the U.S.A., with a 10-year limited parts warranty. Unless explicitly stated otherwise, all washers and dryers are sold individually, not as sets, and all accessories such as pedestals and stacking kits are sold separately. With a large capacity at 4.4 cu. ft., this top load washing machine utilizes the PowerWash. agitator to stir up the concentrated cleaning and robust wash action needed to remove tough stains. This powerful washing machine also muscles in the Best Cleaning in its class driven by the PowerWash cycle. Plus, the Quick Wash cycle helps clean loads faster by shortening cycle time. The Deep Water Wash option gets more water on wash cycles when you want it, for deep water wash clean. Add in the included 10-year limited parts warranty on the motor and stainless steel wash basket, and you've got the power to clean tough loads for the long haul. 7.0 cu. 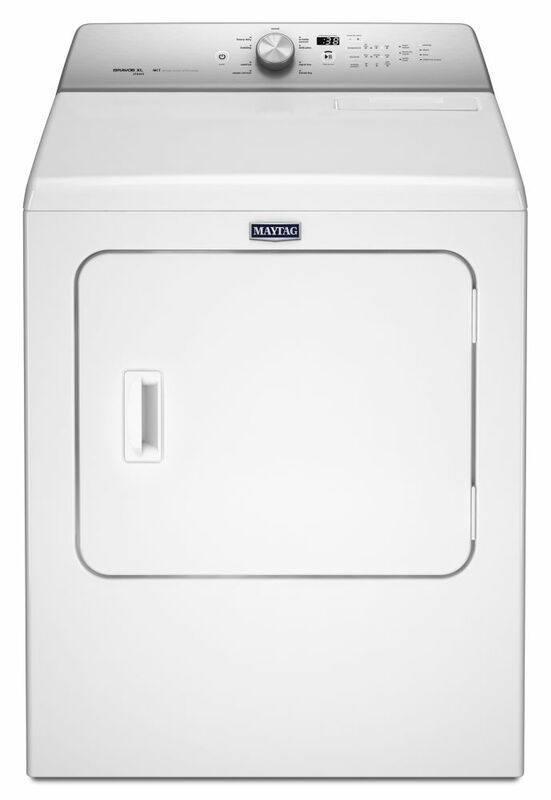 ft. Front Load Dryer with Rapid Dry Cycle in White Maytag<sup></sup> appliances are built tough for the most intimidating jobs, and this large capacity dryer is no exception to the rule. With the PowerDry cycle and an impressive 7.0 cu. ft. capacity, it'll get your largest loads dried every time. And because waiting for the dryer is no fun, Maytag added features like the Rapid Dry cycle to get your small loads ready in no time. With features like an extra interior fin to cut down on balling, tumbling, and tangling and an enhanced steam cycle, this high capacity dryer doesn't take shortcuts when it comes to emptying your hamper. Plus, it's designed, engineered and assembled in the U.S.A., with a 10-year limited parts warranty. Unless explicitly stated otherwise, all washers and dryers are sold individually, not as sets, and all accessories such as pedestals and stacking kits are sold separately. 7.0 cu. ft. Front Load Dryer with Rapid Dry Cycle in White is rated 4.5 out of 5 by 2. Rated 5 out of 5 by Dahill3973 from Maytag Dryer This machine is working well for me. I needed to reverse the hinge on the door and the instructions were clear and easy to follow. Each dry cycle shows the expected time in minutes which helps me know when to come back for the dry laundry. Rated 4 out of 5 by Andy from Maytag front load dryer The only thing I don't like about this product is it is difficult to start. The start button has to be pressed just so in order for it to work.